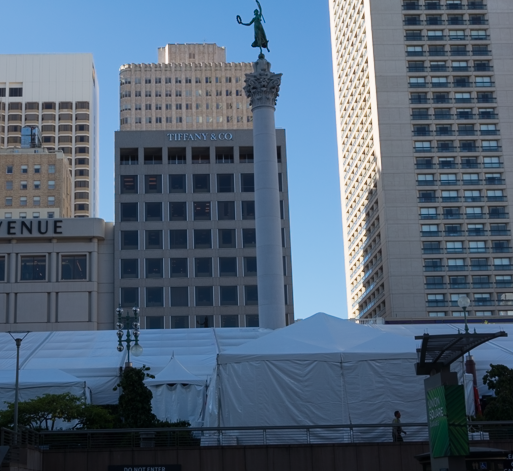 A Great Time under the Tent on Union Square in SF! This weekend we started off with a little misunderstanding about the time we would be allowed in for the 5th Anniversary Friday Night Opening Celebration because the tickets were printed in such a way that caused much confusion (we were not alone). Being the overachievers we are, we arrived early so we were first in line for the 7:15 pm (not 6:30 pm) entrance. We put the time to good use, chatted with a charming, very polite and very apologetic greater who clarified the situation to hundreds who approached her, and also met people around us who had been before and gave us some very good tips. We were prepared with what we learned: (1) the drinks are mostly in the center and the food around the perimeter; (2) to take our time because everyone is there all night and they just keep cooking and pouring; and (3) to enjoy the experience even when it is crowded. At 7:15 pm sharp they let us in, they had been looking at us for 1 hour and 15 minutes so I had no doubt they would be prompt. It was immediately obvious that what we had learned from our early-to-queue compadres was spot on! Everyone got a lanyard (really, not another lanyard), this one actually held your wine glass which proved to be of great assistance as you savored all the tasty bites. 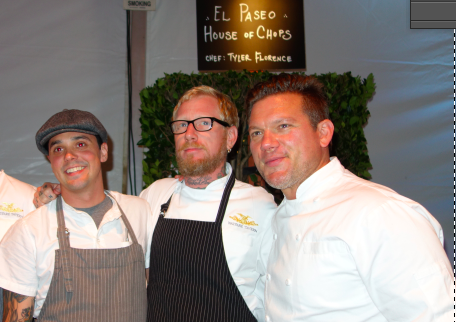 * Tyler Florence is even more handsome in person. * Mixed drinks were one of the stars of the party, form Elixir To Go, Campari, Chambord, Rum, Gin, Bourbon, even Stella was there. * Wines were good all around. From Chile to Portugal , a good representation from California and Washington State, and super rich and smooth Rhone Valley Wines, all fantastic. * The food that stood out was the risotto from Kuleto’s and all the delicious poke and prawns from the restaurants around it , the ham and warm apple something or other from Wayfare Tavern and El Paseo, the caviar blintz roll from The Plumed Horse, something fantastic from The Beach Chalet and great lamb meatballs from a sponsor who also has I love lam chap stick ( I hope it was mint). * Cakes and sweets, yes they were there and we were asked to vote for our favorite cake in the competition, which we could not do in all good faith. With all respect to the pastry chefs, they were a bit lost in the sea of libations and mouthwatering bites. Does no one in the group have a sweet tooth? * Russell Jackson (Food Network Star Finalist) was also there without his Guilty Pleasures briefcase. I wonder how many will be voting for him? So how do you end a night like this? Well….. with handfuls of Fig Newtons and Port that also doubled as a breakfast of champions, the Fig Newtons of course with Starbucks. Categories: Events, Wine | Tags: Campari, El Paseo, Kuleto's, Plumed Horse, SF Chefs, Stella Artois, Tyler Florence, Union Square, Wayfare Tavern, Wines of Chile, Wines of Portugal | Permalink.